What causes disease or injury to the pulp? The most frequent causes are extensive decay, deep fillings, trauma (such as a blow to the tooth), cracks, and gum disease. When a pulp is left exposed to bacteria infection can occur and, if left untreated, can build up at the tip of the root, forming an abscess. This often causes pain and swelling and can lead to the destruction of the bone supporting the tooth. Wherever possible we try to do all the treatment in one visit, but more appointments may be necessary depending on the complexity of the case. 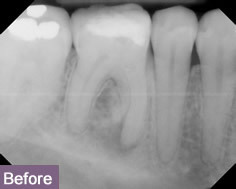 The infected dental pulp is cleaned away, the inside of the roots are also cleaned and slightly enlarged and then finally sealed. 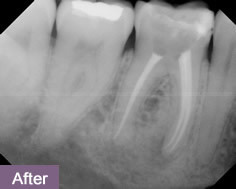 Will the root canal treatment discolour the tooth? This can happen – though rarely. We do have several ways of treating this outcome, such as crowning the tooth, placing a veneer or using a bleaching treatment. The only alternative is to extract the tooth. This can lead to the surrounding teeth shifting position which may cause further problems.